All latches adapt readily to most new or existing gates of any material – metal, wood or vinyl. Two models are key-lockable for added safety. The popular “Top Pull” model is designed especially for swimming pool gates but can be fitted to any gate where child safety is important. 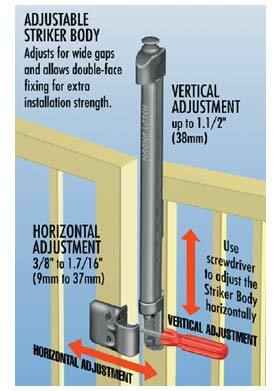 The shorter “Vertical Pull” model is recommended for gates at least 5’ tall. A “Pet Latch” model is also available to provide security for pet safety gates. The latest “Series 2” latches can now be adjusted vertically and horizontally to ensure safe, reliable latching at any time during or after installation. MAGNA•LATCH has been tested to more than 400,000 cycles. 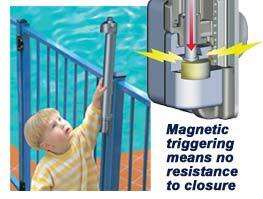 Swimming pool safety codes require all gates to be self-closing and self-latching. The latch has been designed and independently tested to meet strict international safety codes. Awards and endorsements include a prestigious Australian Design Award, a Silver Medal from the International Exhibition of Innovations & New Techniques (Geneva), the Kidsafe Award 2000 (Australia), support by the Royal Life Saving Society (Australia) and endorsement from Water Safety New Zealand…to name a few. Magna•Latch ‘Series 2’ Top Pull and Vertical Pull models offer unprecedented horizontal and vertical adjustment. 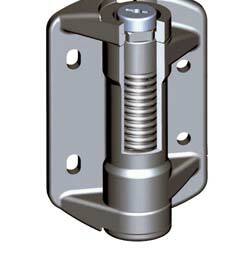 The latch can now be adjusted at any time during or after installation to help overcome gate sag or natural ground movement. 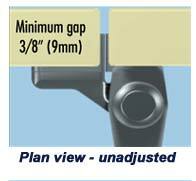 Horizontal adjustment is achieved by adjusting a screw within the ‘Striker Body’, so that the striker can be adjusted across gaps of between 3/8"–1.7/16" (9–37mm). A general-purpose magnetic gate latch that is ideal for home and garden gates. When used on picket style swimming pool gates, a compliant acrylic shiled must be used to prevent latch access by toddlers. Consult local authorities for height measurement/requirements on swimming pool gates. Can be used on some child care centers and some swimming pool gates (depending on the height of the fence). Ideal for most pet enclosures. Fits most gates and all gate materials. Ideal for gate/fence heights of 60" (1500mm) or above. Consult local authorities for height measurement/requirements on swimming pool gates. Ideal for most swimming pool gates and child care centers. Highly child resistant, magnetic latching (no mechanical resistance to closure). Fits most gate/fence heights but is ideal for common gates/ fences 48" (1200mm) high or higher because the latch can be installed so that the release knob is out of reach of small children. Consult local authorities for height measurement/ requirements on swimming pool gates. special glass-fiber reinforced polymer materials. These UV-stabilized materials provide strong, rust-free hinges that won’t bind, sag or stain! And they never require lubrication. The unique, spring-loaded adjustor within most TRU•CLOSE hinges allows instant incremental tension adjustment using only a screwdriver. Quick, easy and safe! 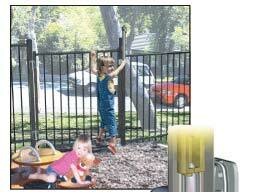 Gates of different sizes and weights incur different loads, so the ability to adjust tension quickly is critical, especially in child safety areas. 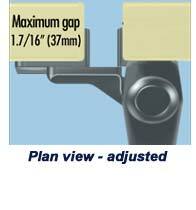 Duty’ models to fit most gate sizes and all gate materials.